Hard Reset JAMBOX – Make sure the JAMBOX is powered on and disconnected from any device – the LED flashes white in this state. Press the TALK button 6 times at a quick, consistent pace, and look for the LED to turn red. PRESS and HOLD the TALK button once the LED turns red. Continue to hold the TALK button until the JAMBOX sounds a short tone, and the LED starts flashing red and white, indicating it has entered pairing mode. Place the paired device closer to your JAMBOX – JAMBOX has a Bluetooth range of approximately 33 feet. Separating the devices further than this can affect the audio quality. Make sure the JAMBOX is charged up. JAMBOX by Jawbone is the smallest, best-sounding wireless speaker and speakerphone around. Just place it anywhere in a room and enjoy pristine streaming audio from your phone, computer, or other Bluetooth devices. Bring music, movies, and all your mobile audio vibrantly to life-all in the palm of your hand. The Jawbone JAMBOX in black-the first intelligent wireless speaker and speakerphone (see larger image). Easily connects with mobile phones, computers, tablets, iPods, or any other Bluetooth device (see larger image). 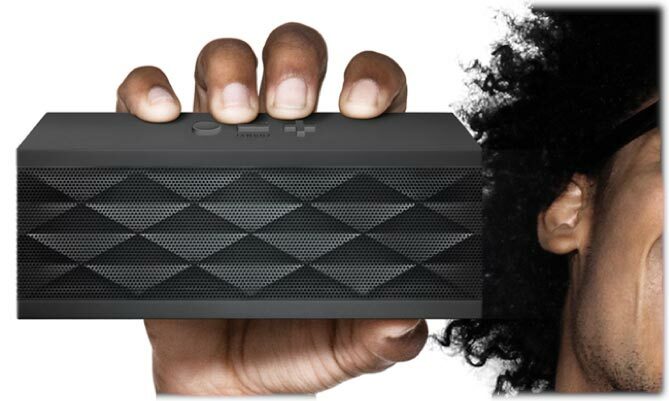 JAMBOX delivers stunning hi-fi audio in a portable wireless speaker so compact you won't believe it when you hear it. It's loud. With an output capacity of 85 decibels, JAMBOX fills even the largest rooms. 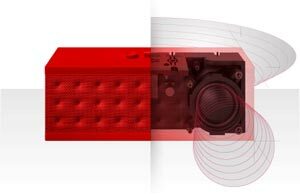 Unlike other portable speakers, JAMBOX is powered by a pair of proprietary, highly sophisticated acoustic drivers, unmatched in their ability to produce extreme high (tweeter) and low (woofer) frequencies from a single, ultra-small dome speaker. They work in concert with an innovative moving-wall passive bass radiator and airtight enclosure to deliver shimmering highs and thumping lows that you can literally feel-the richest sound all in the palm of your hand. JAMBOX is the only speaker that gets smarter every time you plug it in. Just sync it with Jawbone's industry-first MyTALK online platform to download apps, software upgrades, and more. JAMBOX will always be up to date. You get the freedom to bring pristine wireless audio to whatever you're doing, wherever you want. Carry it from room to room or just throw it in your bag. No more cords, docks, or hassles. With a powerful, built-in microphone, JAMBOX frees you to share crisp, clean-sounding conference calls anywhere-in the office, car, at home, alone, or with a group. It's also perfect for sharing video chats via iChat, Skype, and more. Without docks or cords, JAMBOX can be carried from room to room or thrown in a bag. Enjoy sound quality and volume unparalleled for a speaker of its size. JAMBOX looks and feels as striking as it sounds. But with its stainless steel construction and industrial-weight molded rubber casing, it's not just a pretty package-it's a sturdy, portable, and meticulously crafted machine that's built to blast. Don't let tiny computer speakers sap your sound. All your media deserves great audio, no matter what device it's played from. With JAMBOX, you'll feel the thump of every kick drum, the vroom of every car chase, and the roar of the crowd with every buzzer-beater- bringing all your mobile media vibrantly to life. And with up to 10 hours of continuous play, you can blast away all day long with plenty of charge to spare for whatever comes next.